This protocol describes a method for generating cortical interneuron progenitors and post-mitotic interneuron precursors from mouse embryonic stem cells using a modified embryoid body-to-monolayer method. These progenitors/precursors can be used in vitro or fluorescently sorted and transplanted into neonatal neocortex for studying fate determination, or used in therapeutic applications. Tischfield, D. J., Anderson, S. A. Differentiation of Mouse Embryonic Stem Cells into Cortical Interneuron Precursors. J. Vis. Exp. (130), e56358, doi:10.3791/56358 (2017). GABAergic cortical interneurons are a heterogeneous population of cells that play critical roles in regulating the output of excitatory pyramidal neurons as well as synchronizing the outputs of pyramidal neuron ensembles. Deficits in interneuron function have been implicated in a variety of neuropsychiatric disorders, including schizophrenia, autism, and epilepsy. The derivation of cortical interneurons from embryonic stem cells not only allows for the study of their development and function, but provides insight into the molecular mechanisms underlying the pathogenesis of cortical interneuron-related disorders. Interneurons also have the remarkable capacity to survive, migrate, and integrate into host cortical circuitry post-transplantation, making them ideal candidates for use in cell-based therapies. Here, we present a scalable, highly efficient, modified embryoid body-to-monolayer method for the derivation of Nkx2.1-expressing interneuron progenitors and their progeny from mouse embryonic stem cells (mESCs). Using a Nkx2.1::mCherry:Lhx6::GFP dual reporter mESC line, Nkx2.1 progenitors or their Lhx6-expressing post-mitotic progeny can be isolated via fluorescence-activated cell sorting (FACS) and subsequently used in a number of downstream applications. We also provide methods to enrich for parvalbumin (PV) or somatostatin (SST) interneuron subgroups, which may be helpful for studying aspects of fate determination or for use in therapeutic applications that would benefit from interneuron subgroup-enriched transplantations. In both mice and humans, roughly half of all cortical inhibitory interneurons (CIns) originate within a transient subcortical structure known as the medial ganglionic eminence (MGE), where the neuroepithelial progenitors of CIns and other neuronal and glial subgroups express the transcription factor Nkx2.11,2. CIn subgroups or subtypes are defined by intersecting morphological, neurochemical, electrophysiological, and connectivity characteristics3,4. The MGE-derived CIns can be grouped into mostly non-overlapping subgroups based on their expression of either PV or SST, the expression of which correlates with particular electrophysiological and connectivity tendencies5. Dysfunction of interneurons, especially those in the PV subgroup, has been implicated in multiple neuropsychiatric disorders and diseases6,7. The overall goal of this method is to produce stem cell-derived mitotic progenitors and migratory precursors enriched for either PV or SST CIn fate for studying cortical interneuron biology and for use in cell-based therapies. We have developed a scalable, highly efficient method for the derivation of Nkx2.1-expressing interneuron progenitors and their progeny from mESCs. Using a Nkx2.1::mCherry:Lhx6::GFP dual reporter mESC line8, Nkx2.1 progenitors or their Lhx6-expressing post-mitotic progeny can be isolated via FACS and subsequently used in a number of downstream applications. By manipulating a number of signaling pathways, duration of culture, and mode of neurogenesis, we can obtain millions of fluorescently labeled interneuron precursors suitable for a host of downstream applications. Although several other methods exist for generating MGE-like progenitors from mESCs9,10,11,12,13,14, our method, which relies on the Wnt antagonist XAV-939, is particularly efficient at generating Foxg1/Nkx2.1 co-expressing telencephalic progenitors. In addition, the ability to select for interneuron progenitors or their post-mitotic Lhx6-expressing progeny via our dual reporter system, greatly enhances the capacity to generate distinct progenitors and their progeny. NOTE: The dual reporter mESC line described in this protocol is available upon request (sande@mail.med.upenn.edu). NOTE: Warm all media to 37 °C before use in cell culture. Add 50 mL fetal bovine serum (FBS) to 449 mL of Dulbecco's Modified Eagle's Medium (DMEM), and filter through a 500 mL 0.22 µm pore filter unit. Add 1 mL antimicrobial agent (50 mg/mL) after filtration. Store the media at 4 °C for up to 1 month or aliquot and store at ≤ -20 °C. Add 5 mL L-alanine-L-glutamine (100x) and 500 µL 2-Mercaptoethanol (55 mM) to 489.5 mL DMEM: Nutrient Mixture F-12 (DMEM/F-12), and filter through a 500 mL 0.22 µm pore filter unit. Add 1 mL antimicrobial agent (50 mg/mL) and 5 mL N2 supplement-B after filtration. Store the media at 4 °C in the dark for up to 1 month. Add 75 mL serum-free medium supplement, 5 mL L-glutamine (100x), 5 mL MEM Non-Essential Amino Acids (MEM-NEAA) (100x), and 500 µL 2-Mercaptoethanol (55 mM) to 413.5 mL non-glutamine containing DMEM, and filter through a 500 mL 0.22 µm pore filter unit. Add 1 mL antimicrobial agent (50 mg/mL) after filtration. Store the media at 4 °C for up to 1 month. Add 75 mL stem cell grade FBS, 5 mL MEM-NEAA (100x), 5 mL L-glutamine (100x), and 500 µL 2-Mercaptoethanol (55 mM) to 413.5 mL non-glutamine containing DMEM, and filter through a 500 mL 0.22 µm pore filter unit. Add 1 mL antimicrobial agent (50 mg/mL) after filtration. Store the media at 4 °C in the dark for up to 1 month or aliquot and store at ≤ -20 °C. Plate mitotically inactive MEF feeder cells in MEF media onto tissue culture treated plates at 3-4 x 104 cells/cm2. Allow at least 12 h for them to settle in a cell culture incubator at 37 °C with ≥ 95% relative humidity and 5% CO2 before plating the mESCs. If not used immediately, replace the MEF media every 3 days. Dispose of MEFs if not used within 7 days of plating. Add mESCs (density range from 1-4 x 104 cells/cm2) to MEF plates in mESC media containing Mouse Leukemia Inhibitory Factor (mLIF) (1,000 U/mL). Incubate the cells at 37 °C with ≥ 95% relative humidity and 5% CO2. Passage mESCs using trypsin-EDTA (0.05% trypsin) (1:5-1:10) once the dish becomes ~ 70-80% confluent or if the colonies are beginning to touch. This typically occurs every 2 days, but can take up to 4 or 5 days depending on the initial plating density. Maintain the mESCs on a MEF feeder layer in mESC medium to keep pluripotency. Before starting differentiation, passage the cells at least once onto gelatin coated plates without MEFs to dilute out the MEFs. Prepare gelatin coated plates by adding 0.1% gelatin in phosphate buffered saline (PBS) with Ca2+/Mg2+ to a tissue culture treated dish and leaving at 37 °C for at least 1 h. Plate 1.5-2 x 106 cells/10 cm plate (2.7-3.6 x 104 cells/cm2) and allow the cells to expand for 2 days before beginning differentiation. Differentiation day (DD) 0 = "float cells"
After the mESCs have grown on gelatin coated plates for 2 days, aspirate the media and wash the cells once with PBS without Ca2+/Mg2+. Add enough trypsin-EDTA (0.05% trypsin) to cover the surface of the plate (typically 4 mL trypsin-EDTA for one 10 cm tissue culture dish), and place the cells back into the incubator at 37 °C with ≥95% relative humidity and 5% CO2 for 4 min. After 4 min, quench the trypsin-EDTA using 2 times the volume with mESC media. Transfer the cells to an appropriately sized centrifuge tube and centrifuge the cells at 200 x g for 5 min. After 5 min, remove the tube and aspirate the media without disturbing the pellet. Resuspend the pellet in 1 mL KSR:N2 media (1:1) containing the BMP inhibitor LDN-193189 (250 nM) and the Wnt inhibitor XAV-939 (10 µM). Measure the cell concentration using a hemocytometer or automated cell counter. Start growing cells as embryoid bodies (EBs) by adding 75,000 cells/mL in KSR:N2 media (1:1) containing LDN-193189 (250 nM) and XAV-939 (10 µM) in non-adherent tissue culture dishes. Incubate the cells at 37 °C with ≥ 95% relative humidity and 5% CO2. On DD1, prepare for cell "landing" by coating tissue culture treated dishes with poly-L-lysine (10 µg/mL in PBS with Ca2+/Mg2+) overnight (O/N) at 37 °C with ≥ 95% relative humidity or for at least 1 h.
On DD2, aspirate the poly-L-lysine and coat the plates with laminin (10 µg/mL in PBS with Ca2+/Mg2+) O/N at 37 °C with ≥ 95% relative humidity. NOTE: While O/N is optimal, as little as 2 h may be sufficient. If plates are not used by the next day, aspirate laminin, replace with PBS without Ca2+/Mg2+, and store at 4 °C for up to 2 weeks. Before beginning EB dissociation, aspirate the laminin and allow the plates to completely dry in a tissue culture hood. Do not use plates that appear shiny or visibly wet. Transfer the EBs with media into a 15 mL tube and centrifuge for 3-4 min at 15 x g or until the EBs have pelleted. Aspirate the media and add 3 mL of cell detachment solution containing DNase (2 U/mL) and incubate at 37 °C with ≥ 95% relative humidity and 5% CO2 for 15 min. Gently flick the tube every 3 min to aid in EB dissociation. Once the EBs are no longer visible or 15 min have elapsed, add 6 mL KSR:N2 (1:1) containing DNase (1 U/mL) and centrifuge for 5 min at 200 x g.
Plate the cells in KSR:N2 (1:1) containing LDN-193189 (250 nM), XAV-939 (10 µM), and the ROCK inhibitor Y-27632 (10 µM) at 4.5-5 x 104 cells/cm2. On DD5, change media with KSR:N2 (1:1) containing FGF-2 (10 ng/mL), IGF-1 (20 ng/mL), and SSH (50 ng/mL). Prepare tissue culture plates for re-plating on day 8 (step 4.4) using the instructions outlined in steps 3.2-3.3. On DD7, change media with KSR:N2 (1:1) containing FGF-2 (10 ng/mL), IGF-1 (20 ng/mL), and SHH (50 ng/mL). On DD8, re-plate the cells. NOTE: While this step is not essential, re-plating the cells can reduce early-differentiated, unwanted cell types. Re-plating also breaks up balls of cells that make downstream immunohistochemical analyses difficult, and increases the efficiency of FACS at later time points. To re-plate cells, detach the cells from the plate with trypsin-EDTA (0.05% trypsin) for 5 min at 37 °C with ≥95% relative humidity and 5% CO2. Quench the trypsin-EDTA using 2 times the volume with KSR:N2, and centrifuge at 200 x g for 5 min. Filter the cells through a 40 µm filter tube to remove any clumps. Re-plate the cells at 250,000 cells/cm2 in N2/KSR (1:1) containing FGF-2 (10 ng/mL), IGF-1 (20 ng/mL), and Y-27632 (10 µM) with SHH (50 ng/mL). NOTE: If instead, the decision is made not to re-plate the cells on DD8, change the media with KSR:N2 containing SHH (50 ng/mL) every 2 days from DD7 to DD12 and continue to add IGF-1 (20 ng/mL) and FGF-2 (10 ng/mL) until DD9. On DD10, change the media with KSR:N2 containing SHH (50 ng/mL). On DD12, to obtain cells that are enriched for SST subtypes, use FACS to isolate Lhx6::GFP-only expressing cells. To detach the cells, use a non-trypsin containing cell-dissociation reagent rather than trypsin-EDTA. Wash cells once with PBS without Ca2+/Mg2+. Add pre-warmed non-trypsin containing cell-dissociation reagent containing DNase (2 U/mL) to the cells. Place them in the incubator at 37 °C with ≥95% relative humidity and 5% CO2 for 10-30 min or until the cells have detached. Gently tap the plates every 5 min to aid the dissociation. NOTE: For DD11-12 cultures, only 10-15 min may be necessary. For DD15-16 cultures, 30 min or more may be required for complete dissociation. Once the cells have completely lifted off the plate, proceed to FACS isolation using standard protocols or use the cells in other downstream analyses. On DD5, change the media with KSR:N2 (1:1) containing FGF-2 (10 ng/mL) and IGF-1 (20 ng/mL). Prepare tissue culture plates for re-plating on DD8 (step 4.4) using the instructions outlined in steps 3.2-3.3. On DD7, change the media with KSR:N2 (1:1) containing FGF-2 (10 ng/mL) and IGF-1 (20 ng/mL). On DD8, re-plate the cells as described in step 4.4 with the following exceptions: when re-plating the cells, replace SHH with smoothened agonist (SAG; 30 nM) and add atypical PKC inhibitor (aPKCi; 2 µM). Taken together, the re-plating media is now N2/KSR (1:1) containing FGF-2 (10 ng/mL), IGF-1 (20 ng/mL), Y-27632 (10 µM), SAG (30 nM), and aPKCi (2 µM). On DD10, change the media with KSR:N2 containing aPKCi (2 µM). NOTE: At this point, Nkx2.1::mCherry+ cells are enriched to become PV CIns. Detach the cells from the plate for FACS using the same protocol outlined in step 4.6. If the decision is made to collect Nkx2.1::mCherry+ cells at a later differentiation day, disregard this step. On DD12, change the media with KSR:N2 containing aPKCi (2 µM). On DD14, change the media with KSR:N2 containing aPKCi (2 µM). On DD16, change the media with KSR:N2 containing aPKCi (2 µM). On DD17, collect the Nkx2.1::mCherry+ cells using the same protocol outlined in step 4.6. On DD5, change the media with KSR:N2 (1:1) containing FGF-2 (10 ng/mL) and IGF-1 (20 ng/mL). On DD7, change the media with KSR:N2 (1:1) containing FGF-2 (10 ng/mL) and IGF-1 (20 ng/mL). On DD9, change the media with KSR:N2 (1:1). From this point onward, no additional growth factors are necessary. Continue to change the media every 2 days until harvesting the cells on DD17. The protocol described in this paper is a modified version of our published protocols15,16,17 and has been optimized for use with our Nkx2.1::mCherry:Lhx6::GFP dual-reporter mESC line. By adding the Wnt inhibitor XAV-939 from DD0-5, combined with re-plating at DD8, we achieve robust Nkx2.1 induction, wherein upwards of 50% of all DAPI+ nuclei in culture are also Nkx2.1 expressing (Figure 1A, B). Immunohistochemistry for the mCherry and GFP reporters shows clear expression within regions of Nkx2.1-positive immunoreactivity (Figure 1A). FACS of live cells using the native reporter shows that four populations of cells can be clearly isolated: (1) GFP/mCherry double negative cells, (2) mCherry-only expressing cells, (3) GFP-only expressing cells, and (4) GFP/mCherry double-expressing cells (Figure 1C). Using this line, a small fraction of progenitors begins to turn on the mCherry reporter around DD8-9. The mCherry levels peak between DD12-13 and then steadily decline as progenitors exit the cell cycle and produce post-mitotic Lhx6::GFP+ interneuron precursors (Figure 1D). Correspondingly, the Lhx6::GFP reporter turns on between DD9-10 and peaks around DD13-14 (Figure 1D). Although the total number of Lhx6::GFP cells continues to increase in culture, the percentage does not, probably due to the proliferation of other lineages. Once the Lhx6::GFP+ reporter expresses, it remains detectable indefinitely since Lhx6 is stably expressed in mature MGE-derived cortical interneurons18,19. Although Nkx2.1 and Lhx6 expression are largely non-overlapping within the murine forebrain, there is a transient population of Nkx2.1::mCherry and Lhx6::GFP co-expressing cells in culture. This is at least partly due to perdurance of the mCherry reporter beyond the normal timeframe of Nkx2.1 expression, as most of the double-labeled cells do not express detectable levels of Nkx2.1 protein (Tyson and Anderson, unpublished). Cells continuing to express both the Lhx6 reporter and Cherry/Nkx2.1 protein may be striatal interneurons20. However, based on our live imaging studies, there is a window of about 18 h wherein synchronous, newly post-mitotic precursors expressing Nkx2.1::mCherry and Lhx6::GFP can be isolated (Tischfield and Anderson, unpublished, and see Tischfield et al.17). Thus, by collecting Nkx2.1::mCherry and Lhx6::GFP double positive cells at any point during the protocol, it is possible to obtain a population of cells that have predominantly exited the cell cycle within approximately 18 h of each other. This is in contrast to Nkx2.1::mCherry and Lhx6::GFP-only expressing cells, which represent various types of progenitors and precursors, respectively, of varying birthdates. To enrich for PV-fated CIns, SHH should be omitted from the culture media. Of note, consistent with the requirement of SHH signaling to maintain Nkx2.1 expression in mitotic progenitors21, SHH signaling exists in these cultures without exogenous SHH being added since the SHH signaling antagonist cyclopamine eliminates Nkx2.1 expression15. However, if the cells are re-plated on DD8, this endogenous SHH is removed, such that SAG (30 nM) should be added to the media from DD8-10 to maintain Nkx2.1 expression and the production of CIns. Our previous study showed that by withholding SHH from the culture conditions and sorting for Nkx2.1::mCherry+ cells on DD17, a ~2.6:1 ratio of PV:SST cells could be obtained (Figure 2B)15. In contrast to SST subtypes, which are enriched at earlier stages and in the presence of exogenous SHH, increased duration in culture and lack of exogenous SHH enriches for PV subtypes15. 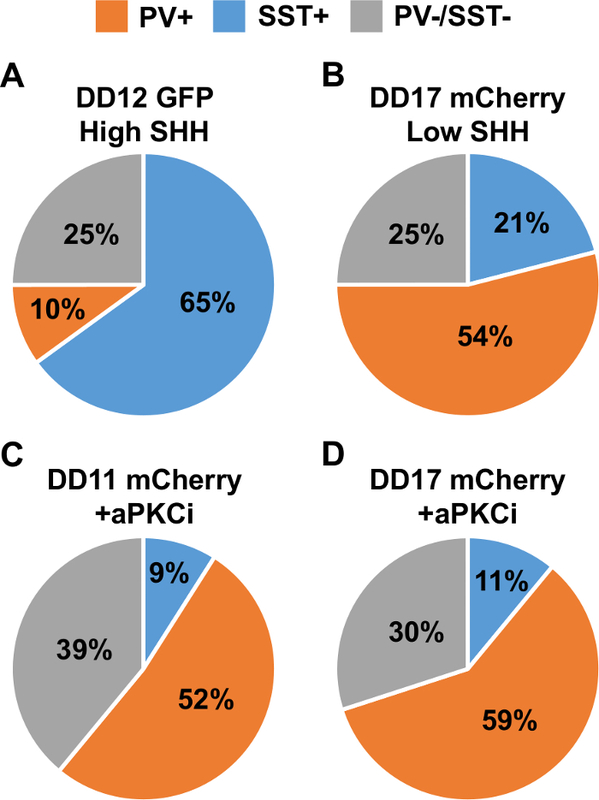 In a more recent study, we found that aPKCi applied to our "MGE" protocol significantly increases the fraction of Nkx2.1::mCherry progenitors that express cyclin D217, a marker of intermediate progenitor cells22. This protocol variation was based on our finding that PV-expressing CIns originate primarily from intermediate progenitors, whereas SST progenitors originate primarily from radial progenitors at the ventricular surface23. We have found that when sorted and transplanted into neonatal mouse neocortex, these progenitors are greatly biased for producing PV-subtypes. By adding aPKCi from DD8-11 and then sorting Nkx2.1::mCherry cells, we were able to obtain a 5.8:1 ratio of PV:SST subtypes (Figure 2C)17. To further enrich for PV subtypes, we have also isolated Nkx2.1::mCherry cells grown in the presence of aPCKi from DD8-17. However, we did not achieve an increase in the PV:SST ratio beyond what we were able to obtain at DD11, despite a marginal increase in the percentage of PV subtypes generated (Figure 2D). Flowcharts for each of these protocols are contained in Figure 3. Immunostaining of mouse brains 30 days post-transplant with anti-PV, anti-SST, and anti-GFP (to enhance the identification of Lhx6::GFP+ cells) antibodies shows that Lhx6::GFP+ cells exhibit mature morphological features with patterns of PV and SST expression akin to their in vivo counterparts (Figure 4 and Figure 5). To aid in determining whether a CIn differentiation appears successful, we have prepared a series of images at each stage of the protocol to demonstrate normal variability (Figure 6, Figure 7, Figure 8). We also include a figure demonstrating how an unsuccessful differentiation appears on DD4 (Figure 9). In general, unsuccessful differentiations will yield low levels (less than 10%) of Nkx2.1 expression and percentages of Nkx2.1::mCherry and Lhx6::GFP induction of approximately 1% or less. Figure 1: Generation of Nkx2.1::mCherry and Lhx6::GFP interneuron precursors. (A) Shown here are representative images of immunostaining for Nkx2.1, Nkx2.1::mCherry (RFP), and Lhx6::GFP (GFP) from a differentiation day 12 (DD12) culture. Note that these images are overlapping channels from the same field of view. (B) Quantification of the average percentage of DAPI+ nuclei that express Nkx2.1 at DD12 in culture (n = 3 independent differentiations). (C) Representative FACS plot demonstrating the four different cell populations that can be isolated using our dual reporter mESC line. Note that mCherry is on the x-axis and GFP is on the y-axis. Thus, the top right box represents cells that are mCherry/GFP-double positive. (D) Time course of Nkx2.1::mCherry and Lhx6::GFP induction from DD6-16 expressed as the percentage of cells in culture that are either mCherry-only expressing, GFP-only expressing, or mCherry/GFP co-expressing. These percentages were obtained from cells grown in the presence of SHH during an SST-enriching protocol and represent averages from 3 independent differentiations. Error bars in (B) and (D) represent SEM. Scale bar = 150 µm (A). Please click here to view a larger version of this figure. Figure 2: Manipulation of culture conditions differentially enriches for PV- versus SST-fated mESC derived cortical interneurons. (A) Percentage of PV+, SST+, and PV-/SST- interneurons obtained when DD12, GFP-only expressing cells grown in the presence of SHH (50 ng/mL) from DD5-12 are transplanted into neonatal neocortex and analyzed 30 days post-transplantation. (B) Percentage of PV+, SST+, and PV-/SST- interneurons obtained when DD17, mCherry-only expressing cells grown without supplemental SHH are transplanted into neonatal neocortex and analyzed 30 days post-transplantation. (C) Percentage of PV+, SST+, and PV-/SST- interneurons obtained when DD11, mCherry-only expressing cells grown in the presence of SAG (30 nM; DD8-10) and aPKCi (2 µM; DD8-11) are transplanted into neonatal neocortex and analyzed 30 days post-transplantation. (D) Percentage of PV+, SST+, and PV-/SST- interneurons obtained when DD17, mCherry-only expressing cells grown in the presence of SAG (30 nM) from DD8-10 and aPKCi (2 µM) from DD8-17 are transplanted into neonatal neocortex and analyzed 30 days post-transplantation. Please click here to view a larger version of this figure. Figure 3: Flowcharts illustrating the different PV- and SST-enriching protocols described in this study. (A) For all of the protocols, the steps leading up to the start of the differentiation including DD0-5 are identical. All cells are grown as embryoid bodies from DD0-3 in N2:KSR (1:1) supplemented with the BMP-inhibitor LDN-193189 and the Wnt inhibitor XAV-939. On DD3, the cells are "landed" in N2:KSR (1:1) containing LDN-193189, XAV-939, and the ROCK inhibitor Y-27632. To enrich for SST-subtypes, SHH is added from DD5-12. Alternatively, SHH is added from DD8-12 since, in our experience, the addition of SHH from DD5 versus DD8 onwards does not significantly impact the ratio of PV:SST subtypes generated. Previous versions of the protocol (see Tyson et al.15) did not incorporate a re-plating step on DD8 and instead supplemented the media with exogenous SHH on DD5. This protocol was later altered to incorporate a re-plating step on DD8 together with the introduction of SHH, neither of which significantly alter the PV:SST ratio. In this "high-SHH" protocol, Lhx6::GFP+ cells grown in the presence of exogenous SHH are FACS isolated on DD12 for use in downstream applications. (B) For the "low-SHH" PV-protocol, exogenous SHH as well as the re-plating step on DD8 are omitted. Instead, Nkx2.1::mCherry+ cells are FACS isolated on DD17 for use in downstream applications. (C) For the "+aPKCi" PV protocol, aPKCi is added together with SAG from DD8-10 and only aPKCi is added from DD10 onward. 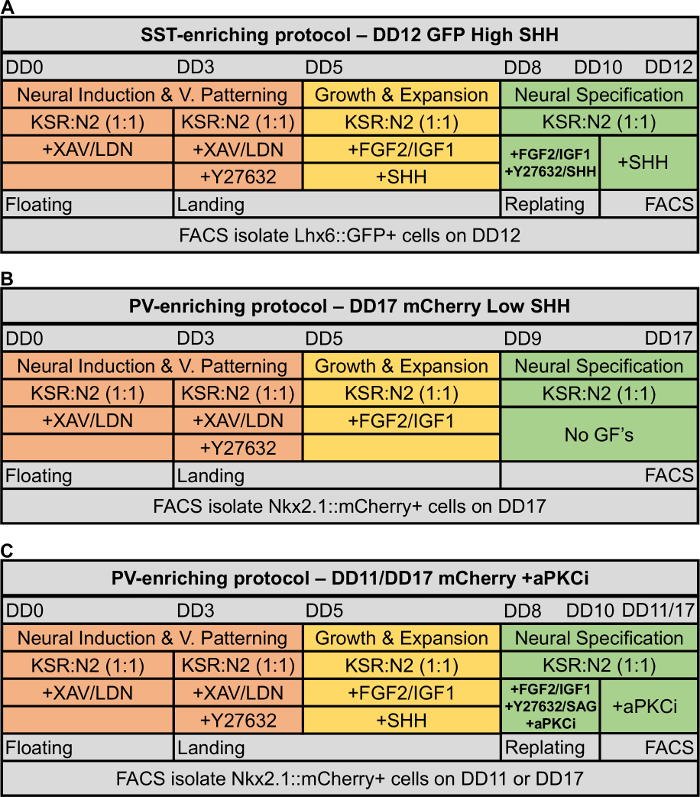 On DD11 or DD17, Nkx2.1::mCherry cells are FACS isolated for use in downstream applications. Please click here to view a larger version of this figure. Figure 4: PV and SST immunostaining in Lhx6::GFP+ cells 30 days post-transplant into neonatal neocortex. (A) High power image of a SST-expressing, Lhx6::GFP+ cell 30 days post-transplant into neonatal neocortex. Within each column of four images are single channel images of Lhx6::GFP, PV, and SST expression with a 3-channel merged image at the bottom. As shown in the top panel, this Lhx6::GFP+ neuron elaborates multiple processes suggestive of a mature morphology. (B) High power image of two PV-expressing, Lhx6::GFP+ cells 30 days post-transplant. (C) High power image of a SST-/PV- double negative, Lhx6::GFP+ cell. Although this cell elaborates multiple processes consistent with complete differentiation and cortical integration, this cell does not clearly express PV or SST. Note that there is a PV+ nucleus adjacent to the Lhx6::GFP+ cell but that it does not overlap. Scale bars = 50 µm (A-C). Please click here to view a larger version of this figure. Figure 5: Medium and low power images of PV, SST, and Lhx6::GFP protein expression 30 days post-transplant into neonatal neocortex. (A) Medium power image of a region of mouse neocortex containing 30 Lhx6::GFP+ cells 30 days post-transplant. These cells were grown using the PV protocol (+aPKCi from DD8-11; FACS isolate and transplant Nkx2.1::mCherry+ on DD11). Of the 30 cells seen here, 16 express PV, 4 express SST, and 10 express neither PV nor SST. (B) Low power image of a region of mouse neocortex containing numerous, well-differentiated Lhx6::GFP+ cells 30 days post-transplant. 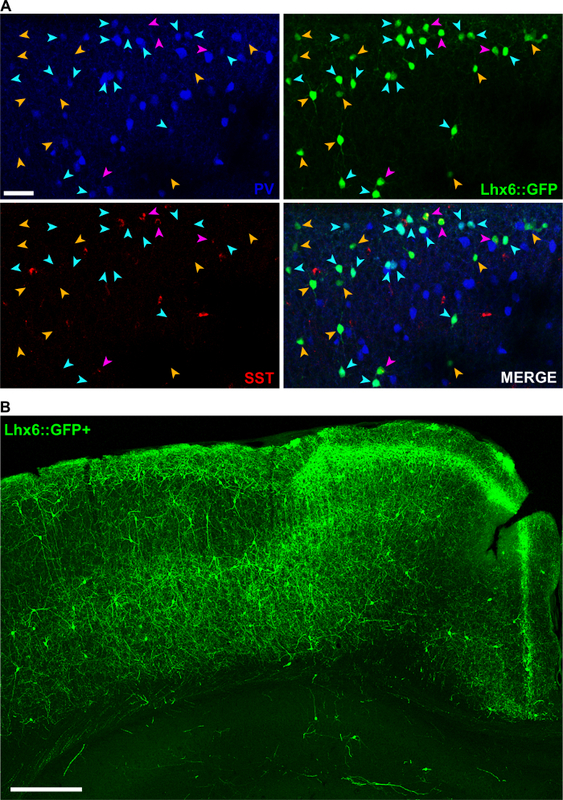 Note the abundance of Lhx6::GFP+ processes coursing throughout the cortex. Occasional cells are also found in the hippocampus, where they appear to integrate and elaborate processes consistent with a mature phenotype. Scale bar = 50 µm (A); 550 µm (B). Please click here to view a larger version of this figure. Figure 6: Normal appearance of mouse embryonic fibroblast feeder layer and undifferentiated stem cells. (A) Shown here are 4X and 10X magnification brightfield images demonstrating the typical appearance of our mouse embryonic fibroblast (MEF) feeder layers 24 h after plating. 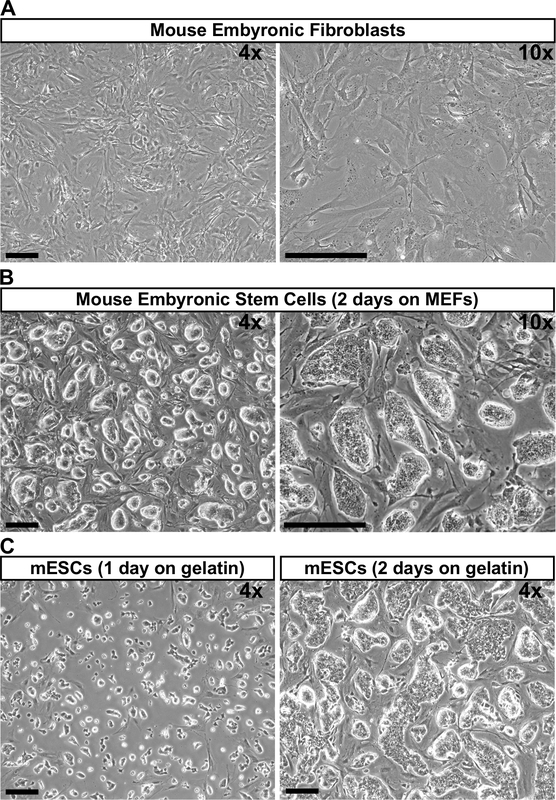 (B) Shown here is the typical appearance of our mouse embryonic stem cells (mESCs) 2 days after plating onto MEF feeders. Note that the colonies have a bright perimeter and are elliptical or ovoid in appearance. If the colonies lose this bright perimeter or begin to send outward projections, these are signs that the cells may be differentiating. (C) Shown here are mESCs 1 and 2 days after re-plating onto gelatin coated dishes in order to dilute out MEF feeders prior to beginning differentiation. Note that the stem cells expand considerably after 48 h on gelatin and begin to reacquire an ovoid appearance with a bright perimeter. Scale bar = 100 µm in 4X and 10X photos. Please click here to view a larger version of this figure. Figure 7: Appearance of mouse embryonic stem cells on differentiation days 1 through 7. 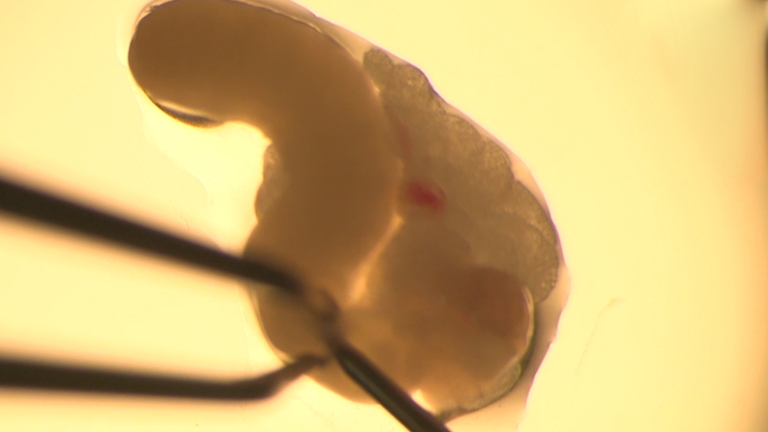 (A) One day after floating, the stem cells can be seen forming small embryoid bodies (EBs). By day two the EBs have grown considerably. Note that some EBs have stuck together and formed larger clusters of cells. We do not find that this negatively impacts the differentiation. After 3 days, the EBs have grown even larger and some no longer transmit light through them. It is normal to see cell debris in the background. (B) Shown here are stem cells 24 h after landing on differentiation day 4 (DD4). Note the density of the cells. Many have begun to extend small processes, which will increase as the differentiation continues. Note here that the cells are even colored with small black dots spread throughout. If the cells are shiny or homogenous appearing, that is a sign of aberrant differentiation. (C) By DD5, the cells have continued to proliferate and form neural rosettes. Many cells have extended long, thin processes. (D) By DD7, the cells should be confluent. It is normal to see a "Swiss-cheese" pattern, wherein large, flat, multinucleated cells (possibly ependymal or glial cells) create circular islands within a layer of neural progenitors. Occasionally when the cell density is higher than normal, this "Swiss-cheese" pattern does not development, as shown in the middle image. Depending on the differentiation, this may affect neural induction. 4x and 10x indicate the magnification. Scale bar = 100 µm in 4X and 10X photos. Please click here to view a larger version of this figure. Figure 8: Appearance of differentiation on days 9 through 14. (A) Single cells can be visualized one day after re-plating. Note their bipolar appearance, which is typical of neural progenitors. The culture is homogenous with few other infiltrating cell types. The density is appropriate for this stage. (B) By DD11, the cells have grown into a monolayer. Similar to earlier stages in the differentiation, large "egg-like" multi-nucleated cells can be seen interspersed throughout. (C) By DD13 the cells have continued to proliferate. They can now be seen forming small mounds. Many "egg-like" cells are still present throughout. From this point onward, the culture will show only a few changes, with the exception of the mounds growing larger. 4X, 10Xx, and 20X indicate the magnification. Scale bar = 100 µm in 4X and 10X photos, and Scale bar = 50 µm in 20X photos. Please click here to view a larger version of this figure. Figure 9: Appearance of an unsuccessful differentiation on day 4. DD4 is important in terms of evaluating the success of a differentiation because it follows one of the most difficult steps of the protocol: the landing on DD3. By DD4, the cells have had 24 h to recover after being dissociated from embryoid bodies. As can be seen here, most of the cells are shiny and homogenous appearing. Interspersed throughout are occasional cells that appear normal, having a darker appearance with small black dots spread throughout. In addition, large flat cells (as can be seen in the bottom left panel) are indicative of aberrant differentiation. In the bottom right panel, at least three small groups of cells (yellow arrows) appear as small embryoid bodies, indicating either faulty differentiation, incomplete EB dissociation, or poor adherence to the surface of the cell culture plate. These images are in contrast to those shown in Figure 7B, which depict healthy, normal appearing cells on DD4. Please click here to view a larger version of this figure. While this method is highly effective at patterning J1-derived mESCs (SCRC-1010), we have experienced variable success with other mESC lines and clonal isolates. For instance, Foxg1::venus mESCs (EB3-derived; Danjo et al.13) respond poorly to this protocol and Foxg1 induction by DD12 is typically on the order of 1-2%. For reasons that we do not fully understand, another Nkx2.1::mCherry:Lhx6::GFP dual reporter clone (termed JQ59) that was isolated simultaneously as the line described in this protocol (termed JQ27), produces less than 1% Nkx2.1-expressing cells when grown under identical conditions. The parent line (J1; ATCC SCRC-1010), however, responds well to this protocol and produces percentages of Nkx2.1-expressing cells on DD12 similar to those shown in Figure 1B. If necessary, the concentrations of XAV-939 and SHH/SAG can be adjusted to optimize the differentiation conditions on a line by line basis. However, our experience using this protocol to differentiate other mESC lines into MGE-like progenitors is limited. Regarding our Nkx2.1::mCherry:Lhx6::GFP dual reporter mESC line, not all Nkx2.1+ cells express mCherry. Although nearly all mCherry+ cells express Nkx2.1 protein, reporter expression lags behind Nkx2.1 protein expression, especially during early stages of the differentiation (DD7-9). The fraction of Nkx2.1+ cells that express mCherry steadily increases throughout the course of the differentiation. At peak levels (~ DD12-14) mCherry is expressed in about 30% of all Nkx2.1 expressing progenitors17. Additionally, the same bacterial artificial chromosome used to drive mCherry expression has been used to drive Cre recombinase in Nkx2.1-expression domains of transgenic mice24. In these mice, Cre-expression was weak within Nkx2.1-expressing cells of the dorsal-most region of the MGE, and fate-mapping with this mouse appeared to under-label SST-expressing CIns that are known to be largely generated from this region25,26,27,28. However, despite these discrepancies, millions of GFP or mCherry-expressing cells can be isolated with only a few hours of FACS. There are two main advantages of this technique. First, when combined with our Nkx2.1::mCherry:Lhx6::GFP dual-reporter mESC line, it is possible to obtain large numbers of interneuron precursors enriched to become PV or SST-fated cortical interneuron subtypes. The second main advantage is the relative ease with which large numbers of interneuron fated cells can be obtained. Although several other modified EB techniques exist to differentiate MGE progenitors and neurons, these protocols typically rely on the use of Wnt-inhibitory molecules such as Dkk113,14,29. We have found that the Wnt inhibitor XAV-939 greatly enhances the generation of pallidal telencephalic progenitors, as evidenced by Foxg1 and Nkx2.1 expression15. As mentioned earlier, several other methods exist for generating MGE-like progenitors from mESCs. Watanabe et al.14 pioneered the field of telencephalic differentiation from mESCs by being the first to develop a serum-free suspension culture method followed by re-plating onto an adherent surface. They found that the Wnt and Nodal antagonists, Dkk1 and LeftyA, respectively, efficiently drove mESCs into early neuroectodermal lineages13. By applying SHH to these cultures, they observed that between 5-15% of all cells in culture co-expressed Nkx2.1/Foxg1 and could be regarded as MGE-like progenitors13. However, while laying the foundation for many studies to come, this study did not have a way to isolate MGE progenitors or enrich for particular CIn subtypes. Several years later, Danjo et al.13 used the same serum-free suspension culture method in combination with the timed administration of various growth factors, in particular SHH, to achieve subregional specification of mESC-derived ventral telencephalic tissues. Using a Foxg1::venus reporter line, they found that SHH administration from DD3-12 after Dkk1 treatment resulted in between 45-68% of all cells in culture expressing the Foxg1::venus reporter13. Within the Foxg1::venus+ population, approximately 32% of cells expressed Nkx2.113. By substituting SHH for SAG and adding Fgf8, they further enhanced the fraction of Nkx2.1 progenitors within the Foxg1::venus+ population to approximately 41%13. When assayed for fate, these cells produced approximately 17% SST, 21% PV, 18% NPY, and 8% calretinin subtypes13. However, while this study described a method to specify CGE versus MGE-derived CIn fates, it did not describe a method to selectively enrich for PV or SST subtypes. The following year, Cambray et al.11 used a serum-free monolayer method with re-plating on DD5 to study the effect of activin on the differentiation and identity of telencephalic neural precursors derived from mouse and human ESCs. Although this study did not report the percentage of Nkx2.1 cells generated in their protocol, they report that approximately 54% of cells in culture co-expressed Nestin/Foxg1 on DD2 (5 days of growth in serum free media followed by an additional 2 days of culture after re-plating)11. They also reported that with the addition of activin, ~55% of cells co-expressed nestin and CouptfII, indicating that these cells may represent caudal ganglionic eminence-like cells, which produce the majority of calretinin-expressing cortical interneurons11. Indeed, by 8 days in culture (13 days overall) 39% of cells were found to co-express calretinin/BIII-tubulin, while 59% of cells were found to co-express GABA/BIII-tubulin11. This study did not examine the production of PV or SST subtypes. Again using a modified EB method, Chen et al.12 demonstrated that MGE-specific enhancer elements could be used to follow and purify stem cell derived MGE-like cells12. In this study, they compared the effect of different culture conditions during directed differentiations of mESCs into MGE-like progenitors using an Lhx6::GFP reporter line; the same line which served as the parent line for the Nkx2.1::mCherry:Lhx6::GFP dual-reporter line described in this manuscript. They showed that by adding Dkk1 to the culture conditions from DD0-3, followed by the addition of SAG, upwards of ~ 10% of all cells in culture expressed Lhx6::GFP12. They also found that the same protocol, applied to the Foxg1::venus line described by Danjo et al.12, resulted in approximately 37% of all cells expressing the Foxg1::venus reporter. When Lhx6::GFP cells were transplanted in vivo, the following average percentages of CIn subtype markers was observed: 22% PV, 58% SST, and 16% NPY12. More recently, other groups have used the forced expression of lineage-defining transcription factors to directly specify CIns. Perhaps the first demonstration of this was by Petros et al.10 who used a doxycycline-inducible promoter to drive Nkx2.1 expression in Ainv15 mESCs that were modified to contain an Lhx6::GFP bacterial artificial chromosome. This study used culture conditions similar to those described in the current manuscript but without the addition of XAV-93910. However, for reasons that are poorly understood, a lower percentage of Lhx6::GFP+ cells were observed under the same differentiation conditions compared to when using the J1 Lhx6::GFP parent line described in this manuscript10. Despite achieving similar levels of Foxg1 expression (total % unknown), there was a moderate reduction in the total number of Nkx2.1 cells with no greater than 2% of all cells expressing the Lhx6::GFP reporter10. This study highlights the inherent differences that exist between various ESC lines and the challenges that researchers face when attempting to apply differentiation protocols to ESC lines different from those that were used to originally develop the protocols. Using an elegant approach, Au et al.9 used the sequential forced expression of transcription factors to generate specific subtypes of cortical interneurons using the same ventral telencephalic differentiation paradigm developed by Watanabe et al.14 While they do not report the exact percentages of Foxg1+, Nkx2.1+, and Olig2+ precursors produced in culture, they state that approximately 50% of all cells in culture differentiated into GABAergic neurons9. At 11 days post-differentiation, EBs were dissociated and transplanted into the MGE of E13.5 host embryos9. A small percentage of these (less than 1%) migrated from the MGE into the cortex, where they were identified by their Dlx5/6-eGFP reporter and analyzed for fate9. The authors observed a variety of percentages of PV, SST, and CGE-like fates based upon their chosen forced induction strategy9. Interestingly, with expression of the transcription factor Lmo3, they observed on average approximately 57% PV, 21% SST, and 15% CGE-derived subtypes (SST-/reelin+ or VIP-only+)9. The greatest percentage of SST subtypes observed was obtained using an Nkx2.1/Dlx2 GOF line, which produced approximately 32% SST, 35% PV and 25% CGE-derived subtypes9. In 2015, Colasante et al.30 showed that the forced expression of five transcription factors (Foxg1, Sox2, Ascl1, Dlx5, and Lhx6) within fibroblasts from GAD67-GFP reporter mice converted 15% of all cells into GABAergic-like CIns. Remarkably, approximately 90% of these cells went on to express PV, with only rare cells expressing SST30. Although this method was not applied to mESCs, it was used with human iPSCs, where it was estimated that approximately 30% of all cells adopted a GABAergic identity30. As shown in Figure 2, there are several ways to generate enriched populations of PV or SST CIns. The main advantages of the PV-protocol utilizing aPKCi over the DD17 protocol are the greater number of cells one can isolate, cell viability, and duration of culture. Although we do not show data for DD17 induction levels in Figure 1, there are roughly twice as many mCherry+ cells at DD11 as there are at DD17 (data not shown). When collecting cells for transplantation, we find that a greater number of starting cells (see below) is beneficial, since roughly 30-50% of cells are lost in the process of concentrating them for injection. In addition, a greater number of cells can be obtained with shorter FACS times, which limits the amount of time that the cells are on ice and lowers the overall cost. 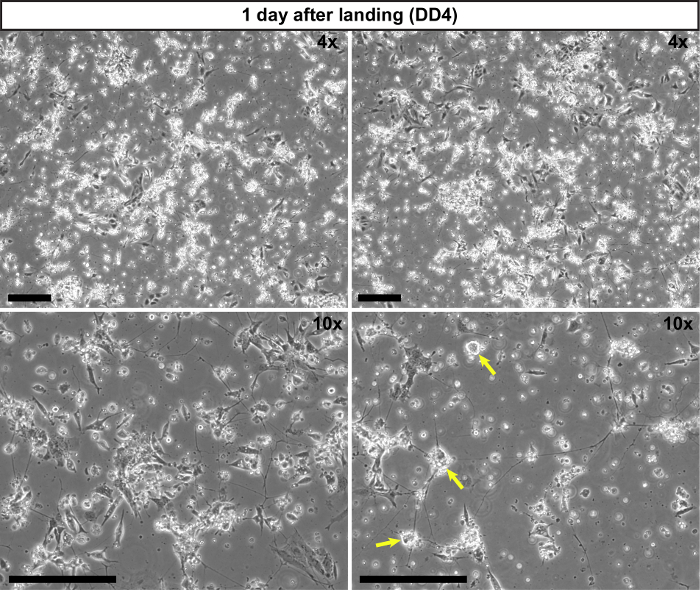 Probably because a higher percentage of the Cherry+ cells are progenitors, cells from earlier stages of culture (e.g., DD11) exhibit greater survival when compared to DD17 cells after transplantation into neonatal neocortex. When large numbers of viable cells are needed, for example in the case of cell transplantation to treat epilepsy, having both a larger starting population and greater viability is a major advantage. As depicted in Figure 2, depending on the protocol, approximately 25-39% of Lhx6::GFP+ cells analyzed 30 days post-transplantation do not express detectable levels of PV or SST protein with routine immunohistochemistry. 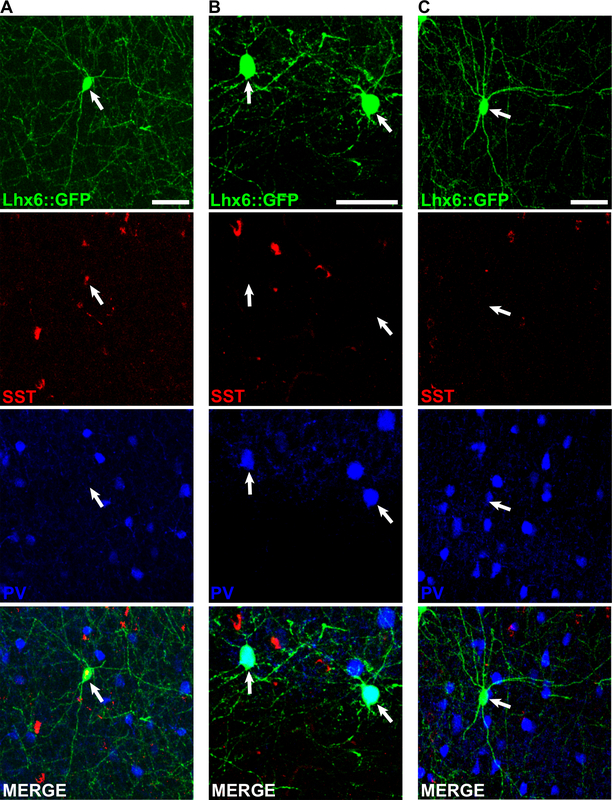 Generally, these PV-/SST- cells express GABA as well as Sox6, a marker of MGE-derived cortical interneurons (see Tyson et al.15, Tischfield et al.17). Less than 1% of PV-/SST- Lhx6::GFP+ cells express markers of other interneuron subgroups, such as calretinin, reelin, or neuropeptide Y (data not shown). This is similar to in vivo fate mapping studies which have shown that between ~ 15-25% of MGE-derived interneurons do not express PV or SST23,25,31. When Nkx2.1::mCherry+ or Lhx6::GFP+ cells are isolated and plated onto rat cortical feeders in vitro, we have found that ~ 40-70% of Lhx6::GFP+ cells analyzed after 28 days in culture are PV-/SST-, with a majority of those that do stain positive expressing SST. This increase in PV-/SST- cells may be due to the absence of an extrinsic maturational signal that is present in vivo, as may especially be the case for mature PV expression, or suboptimal electrophysiological input from feeder cells. Whatever the reason may be, we prefer to transplant cells into neonatal neocortex for fate analysis rather than in vitro differentiation. For most transplantation experiments, we recommend floating on DD0 a minimum of two 10-cm non-adherent tissue culture dishes each containing 7.5 x 105 mESCs in 10 mL of N2/KSR (7.5 x 104 cells/mL; 20 mL total volume). Together, both plates will typically yield 8-12 x 106 cells after EB dissociation on DD3, of which 5.4 x 106 cells can be used to seed two 6-well tissue culture treated plates (50,000 cells/cm2; approximately 110 cm2 total). By DD8, each 6-well plate yields approximately 5-7 x 107 cells, which can then be used to seed an additional three to five 6-well plates at a density of 250,000 cells/cm2 (requiring a total of 4.05 x 107 cells in the case of three 6-well plates or 6.75 x 107 cells in the case of five 6-well plates). By DD14, each 6-well plate will typically yield 1-2.5 x 106 mCherry or GFP-expressing cells. Depending on the needs of the experiment, we have floated a minimum of 7.5 x 105 mESCs for small-scale immunohistochemistry analyses to upwards of 6 x 106 mESCs for large transplantation projects. The most critical steps of the protocol are maintaining the mESCs in a pluripotent state prior to beginning differentiation and the landing/dissociation step on DD3. If the cells have been maintained properly and the landing/dissociation on DD3 is done carefully, the differentiation will usually be successful. Only stem cells that appear healthy and should be used for the differentiation. If EBs fail to form between DD0-3 or form multiple, small, asymmetrical bodies, the differentiation is likely to be unsuccessful. Additionally, during EB dissociation on DD3, the EB's should be carefully monitored until no longer visible by eye to avoid prolonged exposure to the non-trypsin containing cell-dissociation regent. The results presented in this paper were obtained under optimized conditions using quality-controlled reagents. This is important to note since we occasionally have difficulty achieving robust Nkx2.1 induction, and by extension, mCherry and GFP reporter expression. Based on our experience, we believe that lot-to-lot variability of FBS most likely accounts for these changes. As such, it is wise to test different lots of FBS to determine which work best for maintaining mESCs. Although we have not used the 2i/LIF system (serum-free medium containing the MEK inhibitor PD03259010 and GSK-3α/β inhibitor CHIR99021), it is possible that serum-free mESC conditions may produce more consistent results. We have not, however, tested this hypothesis and have no data as to whether the use of serum-free mESC media affects the differentiation of mESCs into MGE-like progenitors. In addition, be sure to use fresh growth factors when possible by aliquoting them for single use. Depending on the user, cell densities may need to be increased to achieve adequate cell survival, especially during the landing step on DD3. Interneurons have the remarkable capacity to survive, migrate, and integrate into host- circuitry post-transplantation. As such, this protocol can be used to transplant interneuron precursors into epileptic mouse models and other models of neurological and neuropsychiatric disease (see Southwell et al.32 and Tyson and Anderson33 for reviews of interneuron cell based therapies). For example, in a recent study Donegan et al.34 enriched populations of PV and SST CIns for transplantation into a mouse model of schizophrenia. They found that PV and SST enriched transplants produced different effects on mouse behavior, with PV enriched populations normalizing the schizophrenia endophenotypes that they were studying. In recent years, the PiggyBac transposon system has been used to achieve stable expression of transgenes in a number of systems. We have used this system to quickly and easily create stably expressing doxycycline-inducible miRNA constructs to study the role of particular genes during interneuron development. We are also using this technology to create dual reporter mESC lines that express channelrhodopsin-2 (ChR2) to optogenetically drive mESC derived interneurons or DREADD receptor technology to turn on or off transplanted cells en masse. We are grateful to Qing Xu for developing the Nkx2.1::mCherry:Lhx6:GFP dual reporter mESC line as well as Jennifer Tyson, Asif Maroof, and Tim Petros for their early work on helping to develop this protocol. We also thank the CHOP flow cytometry core for technical assistance. This work was supported by an NIH R01 MH066912 (SA) and F30 MH105045-02 (DT). Jones, E. G. The origins of cortical interneurons: mouse versus monkey and human. Cereb Cortex. 19, 1953-1956 (2009). Wonders, C. P., Anderson, S. A. The origin and specification of cortical interneurons. Nature reviews. Neuroscience. 7, (6), 687-696 (2006). Ascoli, G. A., et al. Petilla terminology: nomenclature of features of GABAergic interneurons of the cerebral cortex. Nature reviews. Neuroscience. 9, 557-568 (2008). DeFelipe, J., et al. New insights into the classification and nomenclature of cortical GABAergic interneurons. Nature reviews. Neuroscience. 14, 202-216 (2013). Xu, X., Roby, K. D., Callaway, E. M. Immunochemical characterization of inhibitory mouse cortical neurons: three chemically distinct classes of inhibitory cells. J Comp Neurol. 518, 389-404 (2010). Inan, M., Petros, T. J., Anderson, S. A. Losing your inhibition: Linking cortical GABAergic interneurons to schizophrenia. Neurobiol Dis. 53, 36-48 (2013). Benes, F. M., Berretta, S. GABAergic interneurons: implications for understanding schizophrenia and bipolar disorder. Neuropsychopharmacology. 25, 1-27 (2001). Tyson, J. A., Goldberg, E. M., Maroof, A. M., Petros, T. P., Anderson, S. A. Duration of culture and Sonic Hedgehog signaling differentially specify PV versus SST cortical interneuron fates from embryonic stem cells. Development. 142, 1267-1278 (2015). Au, E., et al. A modular gain-of-function approach to generate cortical interneuron subtypes from ES cells. Neuron. 80, 1145-1158 (2013). Petros, T. J., Maurer, C. W., Anderson, S. A. Enhanced derivation of mouse ESC-derived cortical interneurons by expression of Nkx2.1. Stem Cell Res. 11, 647-656 (2013). Cambray, S., et al. Activin induces cortical interneuron identity and differentiation in embryonic stem cell-derived telencephalic neural precursors. Nat Commun. 3, 841 (2012). Chen, Y. J., et al. Use of "MGE Enhancers" for Labeling and Selection of Embryonic Stem Cell-Derived Medial Ganglionic Eminence (MGE) Progenitors and Neurons. PloS one. 8, e61956 (2013). Danjo, T., et al. Subregional specification of embryonic stem cell-derived ventral telencephalic tissues by timed and combinatory treatment with extrinsic signals. The Journal of neuroscience : the official journal of the Society for Neuroscience. 31, 1919-1933 (2011). Watanabe, K., et al. Directed differentiation of telencephalic precursors from embryonic stem cells. Nat Neurosci. 8, 288-296 (2005). Tyson, J. A., et al. Duration of culture and sonic hedgehog signaling differentially specify PV versus SST cortical interneuron fates from embryonic stem cells. Development. 142, 1267-1278 (2015). Maroof, A. M., et al. Directed differentiation and functional maturation of cortical interneurons from human embryonic stem cells. Cell Stem Cell. 12, 559-572 (2013). Tischfield, D. J., Kim, J., Anderson, S. A. Atypical PKC and Notch Inhibition Differentially Modulate Cortical Interneuron Subclass Fate from Embryonic Stem Cells. Stem Cell Reports. 8, 1135-1143 (2017). Liodis, P., et al. Lhx6 activity is required for the normal migration and specification of cortical interneuron subtypes. The Journal of neuroscience : the official journal of the Society for Neuroscience. 27, 3078-3089 (2007). Du, T., Xu, Q., Ocbina, P. J., Anderson, S. A. NKX2.1 specifies cortical interneuron fate by activating Lhx6. Development. 135, 1559-1567 (2008). Marin, O., Anderson, S. A., Rubenstein, J. L. Origin and molecular specification of striatal interneurons. Journal of Neuroscience. 20, 6063-6076 (2000). Xu, Q., Wonders, C. P., Anderson, S. A. Sonic hedgehog maintains the identity of cortical interneuron progenitors in the ventral telencephalon. Development. 132, 4987-4998 (2005). Glickstein, S. B., Alexander, S., Ross, M. E. Differences in cyclin D2 and D1 protein expression distinguish forebrain progenitor subsets. Cereb Cortex. 17, 632-642 (2007). Petros, T. J., Bultje, R. S., Ross, M. E., Fishell, G., Anderson, S. A. Apical versus Basal Neurogenesis Directs Cortical Interneuron Subclass Fate. Cell Rep. 13, 1090-1095 (2015). Xu, Q., Tam, M., Anderson, S. A. Fate mapping Nkx2.1-lineage cells in the mouse telencephalon. J Comp Neurol. 506, 16-29 (2008). Wonders, C. P., et al. A spatial bias for the origins of interneuron subgroups within the medial ganglionic eminence. Dev Biol. 314, 127-136 (2008). Inan, M., Welagen, J., Anderson, S. A. Spatial and temporal bias in the mitotic origins of somatostatin- and parvalbumin-expressing interneuron subgroups and the chandelier subtype in the medial ganglionic eminence. Cereb Cortex. 22, 820-827 (2012). Flames, N., et al. Delineation of multiple subpallial progenitor domains by the combinatorial expression of transcriptional codes. The Journal of neuroscience: the official journal of the Society for Neuroscience. 27, 9682-9695 (2007). Fogarty, M., et al. Spatial genetic patterning of the embryonic neuroepithelium generates GABAergic interneuron diversity in the adult cortex. The Journal of neuroscience : the official journal of the Society for Neuroscience. 27, 10935-10946 (2007). Eiraku, M., et al. Self-organized formation of polarized cortical tissues from ESCs and its active manipulation by extrinsic signals. Cell Stem Cell. 3, 519-532 (2008). Colasante, G., et al. Rapid Conversion of Fibroblasts into Functional Forebrain GABAergic Interneurons by Direct Genetic Reprogramming. Cell Stem Cell. 17, 719-734 (2015). Xu, Q., Cobos, I., De La Cruz, E., Rubenstein, J. L., Anderson, S. A. Origins of cortical interneuron subtypes. The Journal of neuroscience: the official journal of the Society for Neuroscience. 24, 2612-2622 (2004). Southwell, D. G., et al. Interneurons from embryonic development to cell-based therapy. Science. 344, 1240622 (2014). Tyson, J. A., Anderson, S. A. GABAergic interneuron transplants to study development and treat disease. Trends Neurosci. 37, 169-177 (2014). Donegan, J. J., et al. Stem cell-derived interneuron transplants as a treatment for schizophrenia: preclinical validation in a rodent model. Mol Psychiatry. (2016). Deglincerti, A., et al. Self-organization of human embryonic stem cells on micropatterns. Nat Protoc. 11, 2223-2232 (2016). Chambers, S. M., et al. Highly efficient neural conversion of human ES and iPS cells by dual inhibition of SMAD signaling. Nat Biotechnol. 27, 275-280 (2009). Wang, J., et al. Isolation and cultivation of naive-like human pluripotent stem cells based on HERVH expression. Nat Protoc. 11, 327-346 (2016). Zeltner, N., et al. Capturing the biology of disease severity in a PSC-based model of familial dysautonomia. Nat Med. 22, 1421-1427 (2016). Blahos, J., et al. A novel site on the Galpha -protein that recognizes heptahelical receptors. J Biol Chem. 276, 3262-3269 (2001).